"Lloyd Edwards at the Cow Corner wetland with his recent award for the conservation of wetlands in the Eastern Cape. 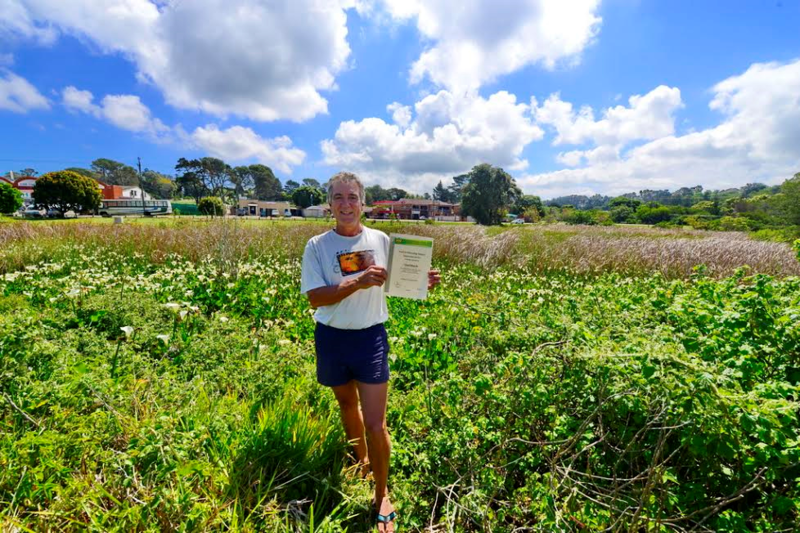 Lloyd has been the custodian of this wetland for the last four years, relying initially on the community to do all the necessary alien clearing and planting." 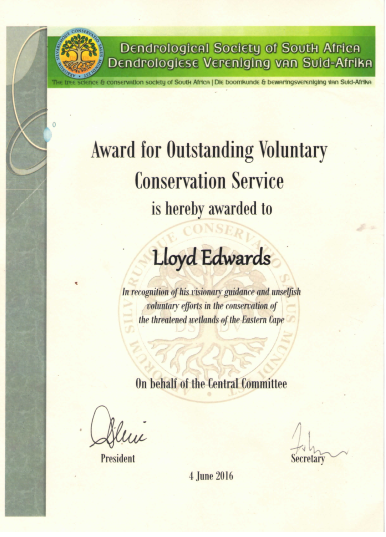 Lloyd Edwards, owner of Raggy Charters, is the chairman of the Eastern Cape Dendrological Society, and as such is dedicated to promoting the knowledge, protection and propagation of trees and the preservation of tree-dominated ecosystems as a contribution to effective environmental conservation and improvement in South Africa. He has recently recieved an Award for Outstanding Voluntary Conservation Service in recognition of his visionary guidance and unselfish voluntary efforts in the conservation of the threatned wetlands of the Eastern Cape. The first project was started eight years ago. Raggy Charters promise to plant at least one tree for every boat cruise done, in order to offset our carbon footprint. We rehabilitate wetlands by tackling the problems of invasive alien species and planting indigenous trees and plants, and currently have 12 projects on-going around the Eastern Cape. For more information on our tree planting, Click on the side pannel, About us, Our projects, Tree planting.